So, I finally got my packages of 300 LEDs (ordered on Ebay from a Chinese manufacturer) and 100 watch batteries for the purpose of experimenting with the concept of the LED throwies today. I made my first one with scotch tape and an orage 10mm LED. It was so exciting when it lit up. Silly, I know, to get excited about such a small thing. By the way, I had ordered the parts for my LED throwie kit earlier this week, before the city of Boston came to a screeching halt due to freaking out about a street art promotion for a cartoon show made of LED lights that caused a bomb scare. Because, well, gosh darnit, those lights must be… a BOMB! In my opinion what happened in Boston was the same result as crying FIRE in a crowded theatre. Except the theatre is the United States of America, and the person crying FIRE is the Bush/Cheney White House. Somebody is winning when our response to new promotional art is to call in the bomb squad. Somehow, though, I don’t think it is Osama bin Laden who has instilled this fear in the American people. Who wins when everyone in the country is afraid? Who gains more power? Anyways, I was very excited to open the packages and construct my first LED throwie. The magnets haven’t arrived yet, so it’s not quite a true throwie but it is still fun to play with. 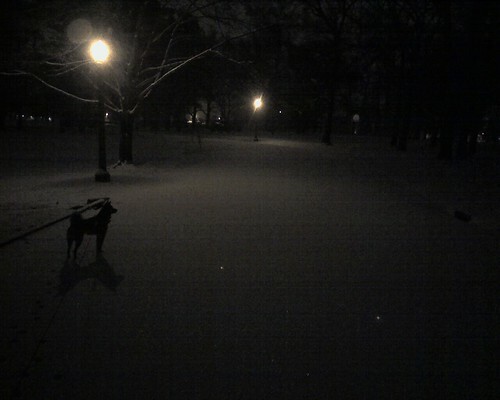 Then it was time for my nightly dog walk with Kuma, going to Tower Grove Park. Tonight it is about 14Â° F out (pretty cold) and the park still has a light covering of snow and ice from yesterday. 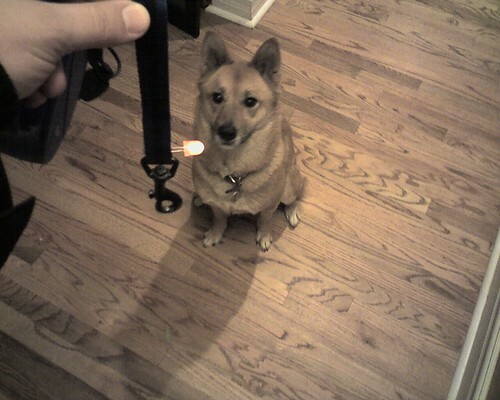 As I was walking along, holding my ever so precious glowing orange LED and playing with it, it occured to me that it might be neat if I attached it to Kuma’s leash so that it would track her movements as she ran around sniffing different squirrel tracks. This is a short movie I made of her dancing movements with her own personal LED throwie light tracer dog leash modification. It’s kind of neat to see Kuma’s movements captured by light. I took the video using my Treo 700p cameraphone. You can hear the crunch of my footsteps on the snowy pavement. More pictures from the walk are here. Quick little recording relating my walk tonight with Kuma and the snow. The ScobleShow is the 700th feed added to RSS2.com. Congratulations, Scoble! P.S. Support for displaying podcast enclosures is probably going to be coming soon so you’ll be able to play or download non-embedded audio and video podcast files directly in your browser. But that is probably for another night, since it will involve hacking on the MagpieRSS RSS feed parser a little bit so it knows that enclosures exist. I enjoyed going to the Clayton Art Fair today after lunch. We walked around for about an hour and a half. Tonight I walked Kuma in the park and did the normal route twice, for a total of an hour of brisk walking (~4.25 miles). All in all, a good day of locomotion. During my dog walk tonight I finally got a chance to listen to the Health Hacks Podcast, and it was excellent. Well, starting this weekend I’ve officially begun the No S diet, and will also be trying the Shovelglove exercises as well. Both make so much sense, and have an elegance to them that feels like a well written shell script — do what you want, no more, no less. I’ll be continuing to track my progress on my Collabofit page: Collabofit – gserafini’s Member Page, and hopefully we’ll be adding Sledgehammer as one of the home exercise activities you can easily track there. My goal is to be at 205 lb by October 5, slimmer by ~ 13 lb in time for my brother’s wedding. We’ll see how it goes. Man. So I was working editing the levels for the latest Christian Science podcast for Lafayette Square Christian Science Society when Audacity crashed. Save early, save often, have to remember that again with Audacity. Audacity found temporary files that were not deleted or saved the last time you used Audacity. Audacity can’t recover them automatically, but if you choose not to delete them, you can recover them manually. This is our first podcast. It is an unedited recording of our weekly Wednesday evening testimony service that is open to the public as are all Christian Science services. You are welcome to join us at our next meeting on Sunday or Wednesday if you are in the area or to subscribe to this podcast if you would like to hear more testimonies of healing. All materials on UbuWeb are being made available for noncommercial and educational use only. All rights belong to the author(s).